All funds raised during the Pink October Campaign are used for two purposes. The first, to raise breast cancer awareness. Secondly, the funds are used for the direct benefit of breast cancer patients through the provision of the latest state-of-the-art machines donated to Mater Dei Hospital. These include QT Breast software, direct monetary donations to the 2 main breast cancer foundations, Europa Donna and Action for Breast Cancer Foundation and also to other NGOs which work tirelessly with cancer patients and their families. 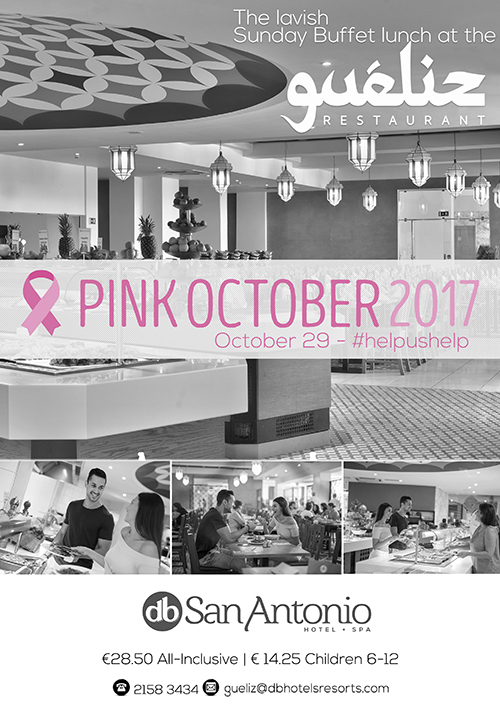 On Sunday, October 29th, part of the renowned All-Inclusive Buffet Sunday Lunch sales in both db Seabank Resort + Spa and db San Antonio Hotel + Spa, will be donated to this worthy campaign. As a special treat, the buffet will be also themed for this special occasion. Pearl Spas which form part of the same group, with outlets in both hotels, will also be donating part of this month’s sales from all treatments and massages. Both spa receptions are also collecting donations for the same cause. Reserve your table for the Sunday All-Inclusive Lunch at db Seabank Resort +Spa by calling 2289 1150 and at db San Antonio Hotel + Spa by calling 2158 3434. Reservations for Pearl Spas can be done by visiting www.pearlspas.com.